The Friends worked closely with the local bicycle advocacy group to identify, purchase and install bicycle racks at various high-traffic locations throughout the park. The team also produced an online version of our printed trail map making it easy for visitors to navigate the many trails and pathways throughout the park. The Chetzemoka Interpretive Trail is a new project envisioned by the Port Townsend Native Connections Action Group and co-sponsored by the Jamestown S’Klallam Tribe, and endorsed by the Jefferson County Historical Society. The Friends of Fort Worden have agreed to fund the interpretive signage for the Point Wilson location #14. The Friends of Fort Worden are committed to minimizing the use of disposable plastic water bottles in the Park. 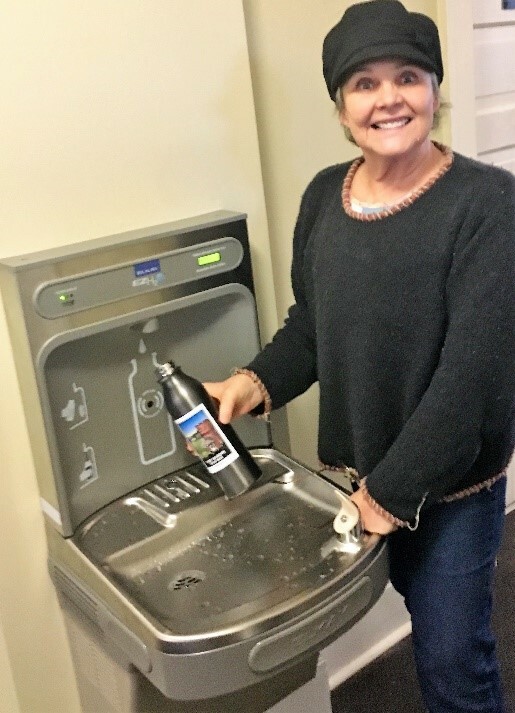 Consequently, we have purchased and installed two water bottle filling stations. At the suggestion of the FWSP Manager, the Friends purchased and installed a public viewing scope with standard and ADA-accessible viewing heads. It is located on the Triangle of Fire viewpoint and is free for public use. Future plans are to install additional viewing scopes in several other locations in the Park. In order to provide more community interaction with FWSP, the Friends have organized quarterly “Sundays in the Park” walks focusing on geology, native plants, birds, and marine life found in FWSP. The walks are led by local experts and are well attended by the public. Thank you for subscribing to our quarterly newsletter! You’ll now be in the know about future events, volunteer opportunities and other Friends of Fort Worden news.